The summer is nearly upon us, and the hour of outdoor drinking is nigh. Nearly every village, no matter how remote, has thoughtfully been equipped with a pub, and warm afternoons now find people installed in benches out front, enjoying a leisurely pint or seventeen while frying their fishbelly white hides. 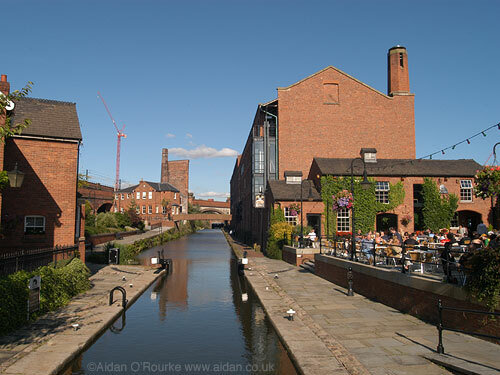 Topping the list in Manchester are usually Dukes 92, The Ox and the other perenially popular bars along the canal in Castlefield, as well as those with outdoor tables in the village. But I'm also partial to The Moon in Piccadilly Basin, which is maybe the most hidden bar in the city (I love that strange reflecting pool.) And doesn't the brilliant Fringe Bar have a beer garden overlooking scenic Ancoats? You've gotta love that. To assist your planning, some of our bloggers have put a lot of thought into the best places for an al fresco cocktail. Flew From the Fylde Coast (yup, this is a new blogger, to be added to the blogroll shortly) has a top 5 summary of quality outdoor joints in the city. But Salford is not to be overlooked. Mike of Where cranes connect the sky has been on a quest to find Salford's most idyllically located boozer. Contenders so far are The Old Pint Pot by the university and The Mark Addy, on the banks of the mighty Irwell. Anyone else got outdoor drinking reccomendations? oooo, I stumbled across the Moon on one of my Manchester walk abouts but haven't been there for a drink yet. I'll add it to my (long) list of bars to frequent soon. I wouldn't say that the Fringe beer garden has much of a view of anything, but I have had a few memorable, if fuzzy, evenings there. I'd say The Oyster Bar for outside summer sun... but then, it's always jam-packed and nowhere near as nice as Dukes' outdoor surroundings. hey guys, come on now, there's a reason these secret places are so nice... it's because they're SECRET! shhhhhhhhhhhhh, or there will never be a bench available at any of them! * jam street, carlton club (membs only but well worth it) & hilary step, whalley range. * the bar & the marble (run by knott the fringe folks), bar480, the lounge, horse & jockey, ... oh hell, pretty much any of chorlton's throng of boozers. btw, my top tip for a guaranteed seat outdoors is to go drinking in the rain. i even find the diluted beer allows me to keep drinking longer! what about a manchizzle pubcrawl, yankunian?